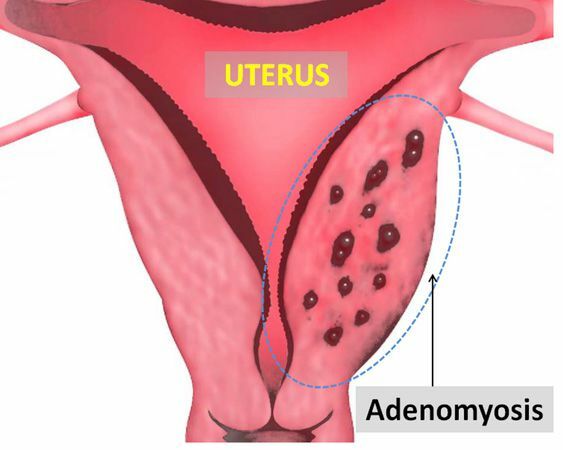 Adenomyosis refers to the presence of ednoemtrial glands in the uterine muscle. Amount of menstrual bleeding: patients may soak through a pad/tampon less then every 2 horus. Abodminla exam can reveal a bulky, globuler, and often tender uterus. Histology: the most definitive means of diagnosing this condition is by analyzing tissue (histologically) obtained from a hysterectomy. The presence of endometrial cell types in the myometrium will serve to be diagnostic. Total hysterectomy is really the only means of definitive treatment. Because this condition is limited to the uterus, the ovaries can be spared during this procedure.